Meralgia paraesthetica comes from the Greek words meros (thigh) and algos (pain). Simply put, meralgia paraesthetica is usually an entrapment syndrome of the lateral femoral cutaneous nerve (LFCN). It may be iatrogenic after medical or surgical procedures, or result from a neuroma. The segmental origin is L2/L3 and it is a purely sensory nerve with no motor fibres. Meralgia paresthetica is a condition classically characterized by dull ache, itching, tingling, numbness and/or burning pain in the outer part of your thigh. Classically the pain is on the outer side of the thigh, but because the femoral nerve has so many small off shoots, variants may be in the groin and front of the leg. The pain associated with this condition may vary in intensity from mild to very severe and frequently occurs following activity with relief following rest. In children and adolescents the presentation is severe pain causing marked restriction of activities. It may be bilateral. There is usually no acute low back pain, though there may be a dull ache in the upper lumbar spine. Spinal and joint mechanical motion fixations are usually found here by your chiropractor and is large part of the problem. 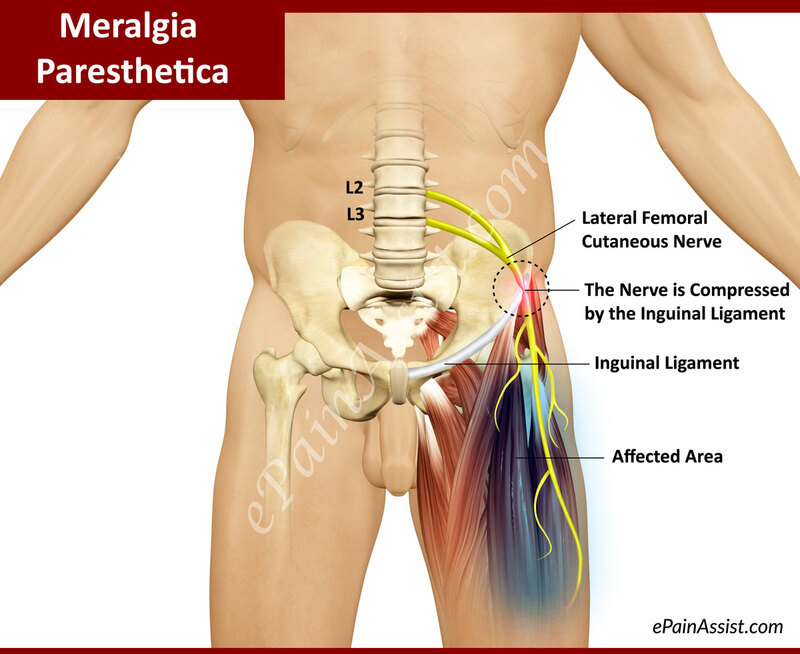 The cause of meralgia paresthetica is compression (entrapment) of the lateral femoral cutaneous nerve (LFCN) in the groin which is part of the lumbar plexus nerve network. This nerve originates from the upper lumbar spine, L2 and L3, meanders down a large muscle deep in the belly called the Psoas, crosses another in the pelvis called the Iliacus, and then is trapped as it passes under the Inguinal ligament. The LFCN provides sensation to the antero (front) and lateral (side) aspect of the thigh and has some overlap in sensation with the femoral nerve. As a pure sensory nerve, it does not operate any muscles. 1. The nerve may be angulated or compressed against a sharp edge of fascia as it pierces the iliac fascia prior to exiting the pelvis beneath the inguinal ligament. 2. The nerve may be subjected to friction where it is wedged between the attachment of the inguinal ligament with the ASIS. 3. The nerve may pass through the tendinous fibers of the inguinal ligament and be pinched at this site. 4. The nerve may be compressed as it crosses the iliac crest or may be compressed within the substance of the sartorius muscle or tensor fascia lata muscle (ITB band). Numerous factors may contribute to mechanical damage of the lateral femoral cutaneous nerve as it exits under the inguinal ligament, such as obesity, constricting garments or girdles, direct pressure on the thigh in the region of the nerve, postural alterations, or increased demands placed on the abdominal muscles secondary to pregnancy or marching. Meralgia paraesthetica can also occur in pregnancy and if there is tense ascites. It may be a result of trauma, previous surgery or, in some cases, may arise from abduction splints used to treat Perthes' disease, also called Calvé-Legg-Perthes disease. Various sports and physical activities have been implicated, including gymnastics, baseball, soccer, bodybuilding and strenuous exercise. Lying for long periods of time in the fetal position and lying prone after lumbar spine surgery have also been identified as possible causes. Risk factors can arise in the most unlikely scenarios. A spate of meralgia was found to be due to the body armour worn by American soldiers in Iraq. It occurs more commonly in those with diabetes than in the general population. Most cases are idiopathic. Meralgia paresthetica affects men more than women due to possible occupational considerations and may be bilateral in approximately 25 percent of cases. An incidence has been estimated at 4.3 per 10,000 person years. It occurs most commonly in people between the ages of 30 to 40 years. The condition is thought to be much rarer in children. Clinically, the history may reveal that the pain is potentiated by extension and relieved by flexion, as well as being aggravated by long periods of standing or walking. Physical examination may reveal a sensory loss taking the form of a reduction of tactile sensation in the distribution of the lateral femoral cutaneous nerve. But, with groin pain, various impingement problems in the hip and lateral thigh should also be considered including involvement of the Iliotibial Band (ITB). Conditions like femoro-acetabular impingement syndrome in the younger person may progress to hip arthritis in the older patient. Meralgia paresthetica symptoms will not extend to the lower leg and feet. If you have tingling in legs and feet then your chiropractor will be considering a pinched sciatic or femoral nerve. This is more serious as they are mixed nerves, carrying motor impulses to the muscles. The key sign is that sciatic and femoral stretch tests will be positive, which is less likely with a pinched lateral femoral cutaneous nerve. Also reflexes will be affected. The entrapment causes pain classically on the side of the thigh, but also sometimes the front of the upper leg and a variant to the groin as a possible result of: swelling, trauma, or pressure narrowing and squeezing the nerve. Tight clothing, obesity or weight gain, and even pregnancy are also common causes. The pain can be reproduced by deep palpation just below the anterior superior iliac spine (pelvic compression) and also by extension of the hip. There is altered sensation over the antero-lateral aspect of the thigh. There is no motor weakness. Rarely, pressure on the lateral cutaneous femoral nerve can arise from a mass in the retroperitoneal space - eg, tumours, iliacus haematoma. The pelvic compression test is highly sensitive and the diagnosis can often be made with this test alone. Other tests to rule out differential diagnoses might include fasting blood glucose, MRI of the lumbar spine and radiographs for possible pelvic fracture or cancer. These findings may be accompanied in three-fourth of cases by a tender spot over the inguinal ligament that is two finger widths medial to the anterior superior iliac spine. Symptoms may also be aggravated by clinically reproducing hip extension through orthopedic tests such as Nachlas' test. In diagnosing meralgia paresthetica, care should be taken to rule out intraspinal, retroperitoneal, abdominal, or pelvic pathologies, diabetes mellitus, and L3 disc prolapses. Clinically, the L3 disc prolapse may produce alteration of the patellar reflex. In contrast, the reflex will not be altered in meralgia paresthetica. In most cases, meralgia paresthetica can be relieved with conservative measures, such as wearing looser clothing and hands on chiropractic treatment combined with other modalities. In severe cases, treatment may include medications to relieve discomfort, occasionally injections are used but surgery is rare. As mentioned above, most cases of meralgia paresthetica will respond to conservative care. As stated below, there are many modalities that may prove helpful in the treatment of this condition including transverse friction techniques to break up possible adhesions affecting the lateral femoral cutaneous nerve at the inguinal region. Postural alterations and functional spinal problems should also be addressed in the management of this condition. Chiropractic treatment for patients with this condition is vital to hasten the healing process, ensure an optimal outcome and decrease the likelihood of injury recurrence. This chiropractic treatment programme would probably cover a 6-8 week period, with perhaps 10-15 treatments. Every person obviously is different. Some may require less, other more. If after 3-4 weeks there is no definite progress, then a medical consultation should be considered. The evidence base for the treatment of meralgia paraesthetica is weak, and randomised controlled trials are needed. In the case of obesity, loss of weight may correct and improve the condition but is not guaranteed. It should resolve after pregnancy and tapping of ascites should help. Idiopathic meralgia paraesthetica usually improves with non-operative modalities, such as removal of compressive agents, non-steroidal anti-inflammatory drugs (NSAIDs), anticonvulsants or tricyclics and, if necessary, local corticosteroid injections. One study has reported successful use of pulsed radiofrequency neuromodulation. Transcutaneous electrical nerve stimulation (TENS) has been found helpful, especially when combined with pregabalin. Other physical therapies reported in being helpful in relieving chronic symptoms include mobilisation/manipulation for the pelvis, myofascial therapy for the rectus femoris and iliopsoas, transverse friction massage of the inguinal ligament, stretching exercises for the hip and pelvic musculature,and pelvic stabilisation/abdominal core exercises. One study has reported the use of Kinesio® tape (an elastic strapping used in physical therapies) applied to the area where symptoms were experienced. The use of ultrasound-guided perineural injections is being explored. If the pain is severe, operative decompression should be considered. A supra-inguinal or infra-inguinal approach may be used. Most cases are self-limiting. The paraesthesia tends to resolve over time but the numbness can persist. 1. Houle S; Chiropractic management of chronic idiopathic meralgia paresthetica: a case study. J Chiropr Med. 2012 Mar;11(1):36-41. doi: 10.1016/j.jcm.2011.06.008. 2. Harney D, Patijn J; Meralgia paresthetica: diagnosis and management strategies. Pain Med. 2007 Nov-Dec;8(8):669-77. 3. Dharmasaroja P, Dharmasaroja P; Meralgia paresthetica-like syndrome may be caused by transient lumbar nerve root injury without definite compression: a case report. J Med Assoc Thai. 2010 Dec;93 Suppl 7:S307-10. 4. Kosiyatrakul A, Nuansalee N, Luenam S, et al; The anatomical variation of the lateral femoral cutaneous nerve in relation to the anterior superior iliac spine and the iliac crest. Musculoskelet Surg. 2010 May;94(1):17-20. doi: 10.1007/s12306-010-0054-y. Epub 2010 Feb 5. 5. Cheatham SW, Kolber MJ, Salamh PA; Meralgia paresthetica: a review of the literature. Int J Sports Phys Ther. 2013 Dec;8(6):883-93. 6. Fernandez-Mayoralas DM, Fernandez-Jaen A, Jareno NM, et al; Meralgia paresthetica in the pediatric population: a propos of 2 cases. J Child Neurol. 2010 Jan;25(1):110-3. Epub 2009 May 20. 8. Mondelli M, Rossi S, Romano C; Body mass index in meralgia paresthetica: a case-control study. Acta Neurol Scand. 2007 Aug;116(2):118-23. 9. Fargo MV, Konitzer LN; Meralgia paresthetica due to body armor wear in U.S. soldiers serving in Iraq: a case report and review of the literature. Mil Med. 2007 Jun;172(6):663-5. 10. Edelson R, Stevens P; Meralgia paresthetica in children. J Bone Joint Surg Am. 1994 Jul;76(7):993-9. 11. Shetty VD, Shetty GM; Persistent bilateral anterior hip pain in a young adult due to meralgia paresthetica: a case report. Cases J. 2008 Dec 15;1(1):396. doi: 10.1186/1757-1626-1-396. 12. Nouraei SA, Anand B, Spink G, et al; A novel approach to the diagnosis and management of meralgia paresthetica. Neurosurgery. 2007 Apr;60(4):696-700; discussion 700. 13. Parisi TJ, Mandrekar J, Dyck PJ, et al; Meralgia paresthetica: relation to obesity, advanced age, and diabetes mellitus. Neurology. 2011 Oct 18;77(16):1538-42. doi: 10.1212/WNL.0b013e318233b356. Epub 2011 Oct 5. 14. Pearce JM; Meralgia paraesthetica (Bernhardt-Roth syndrome). J Neurol Neurosurg Psychiatry. 2006 Jan;77(1):84. 15. Freeman TL et al; Lower Limb Mononeuropathy. In: Cuccurullo S, editor. Physical Medicine and Rehabilitation Board Review. New York: Demos Medical Publishing; 2004. 16. Feinberg J, Sethi S; Sciatic neuropathy: case report and discussion of the literature on postoperative sciatic neuropathy and sciatic nerve tumors. HSS J. 2006 Sep;2(2):181-7. doi: 10.1007/s11420-006-9018-z. 17. Yi TI, Yoon TH, Kim JS, et al; Femoral neuropathy and meralgia paresthetica secondary to an iliacus hematoma. Ann Rehabil Med. 2012 Apr;36(2):273-7. doi: 10.5535/arm.2012.36.2.273. Epub 2012 Apr 30. 18. Grossman MG, Ducey SA, Nadler SS, et al; Meralgia paresthetica: diagnosis and treatment. J Am Acad Orthop Surg. 2001 Sep-Oct;9(5):336-44. 19. Russo MJ, Firestone LB, Mandler RN, et al; Nerve conduction studies of the lateral femoral cutaneous nerve. Implications in the diagnosis of meralgia paresthetica. Am J Electroneurodiagnostic Technol. 2005 Sep;45(3):180-5. 20. Khalil N, Nicotra A, Rakowicz W; Treatment for meralgia paraesthetica. Cochrane Database Syst Rev. 2008 Jul 16;(3):CD004159. 21. Chung KH, Lee JY, Ko TK, et al; Meralgia paresthetica affecting parturient women who underwent cesarean section -A case report-. Korean J Anesthesiol. 2010 Dec;59 Suppl:S86-9. doi: 10.4097/kjae.2010.59.S.S86. Epub 2010 Dec 31. 22. Atamaz F, Hepguler S, Karasu Z, et al; Meralgia paresthetica after liver transplantation: a case report. Transplant Proc. 2005 Dec;37(10):4424-5. 23. Patijn J, Mekhail N, Hayek S, et al; Meralgia Paresthetica. Pain Pract. 2011 May-Jun;11(3):302-8. doi: 10.1111/j.1533-2500.2011.00458.x. 24. Philip CN, Candido KD, Joseph NJ, et al; Successful treatment of meralgia paresthetica with pulsed radiofrequency of the Pain Physician. 2009 Sep-Oct;12(5):881-5. 25. Barbarisi M, Pace MC, Passavanti MB, et al; Pregabalin and transcutaneous electrical nerve stimulation for postherpetic neuralgia treatment. Clin J Pain. 2010 Sep;26(7):567-72. doi: 10.1097/AJP.0b013e3181dda1ac. 26. Kalichman L, Vered E, Volchek L; Relieving Symptoms of Meralgia Paresthetica Using Kinesio Taping: A Pilot Study. Arch Phys Med Rehabil. 2010 May 27. 27. Tagliafico A, Serafini G, Lacelli F, et al; Ultrasound-guided treatment of meralgia paresthetica (lateral femoral cutaneous neuropathy): technical description and results of treatment in 20 consecutive patients. J Ultrasound Med. 2011 Oct;30(10):1341-6. 28. Ferra Verdera M, Ribera Leclerc H, Garrido Pastor JP; [2 cases of paresthetic meralgia of the femoral cutaneous nerve]. Rev Esp Anestesiol Reanim. 2003 Mar;50(3):154-6. 29. Houle S; Chiropractic management of chronic idiopathic meralgia paresthetica: a case study. J Chiropr Med. 2012 Mar;11(1):36-41. doi: 10.1016/j.jcm.2011.06.008. 30. Mumenthaler M: Neurology. Thieme-Stratton, Inc., New York, 1983. 31. Sunderland S: Nerves and Nerve Injuries, ed 2. Churchill-Livingstone, New York, 1978. 32. Turek SL: Orthopedics: Principles and Their Application, ed 4. J.B. Lippincott, New York, 1984. 33. Mohr JP: Manual of Clinical Problems in Neurology, ed 2. Little, Brown and Company, Boston, 1989. 34. Kramer J: Intervertebral Disc Disease: Causes, Diagnosis, Treatment, and Prophylaxis. Year Book Medical Publishers, Chicago, 1981. 35. Bradley WG, Daroff RB, Fenichel GM, and Marsden CD: Neurology in Clinical Practice: The Neurological Disorders. Butterworth-Heinemann, Boston, 1991. Disclaimer: This article is for information only and should not be used for the diagnosis or treatment of medical conditions. Dr. Pisarek has used all reasonable care in compiling the information, but makes no warranty as to its accuracy. Consult a health care professional for diagnosis and appropriate treatment.